Amidst the holiday buzz, it’s easy for little ones to forget that Thanksgiving isn’t just about pumpkin pie, mashed potatoes and a day off of school. Teaching kids the importance of thankfulness will help them develop empathy, kindness and a deeper sense of appreciation for everything they have this holiday season. According to a UC Berkeley study, children who practice gratitude feel considerably happier, more enthusiastic and engaged. 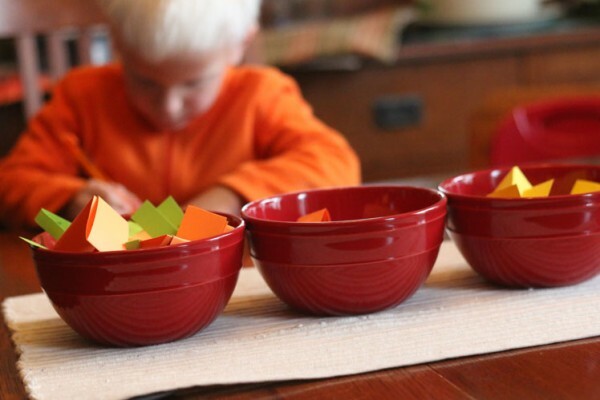 This year, try these thankfulness-themed crafts to teach little ones about the true meaning of Turkey Day: gratitude. Nothing says Thanksgiving better than a hand turkey—at least I think so! This craft is the perfect way to get in the holiday spirit. To get started, create a double-sided handprint that the kids can fill out as a card and give to someone they’re thankful for. Just add feathers and googly eyes— and voila! Your turkey card is complete. 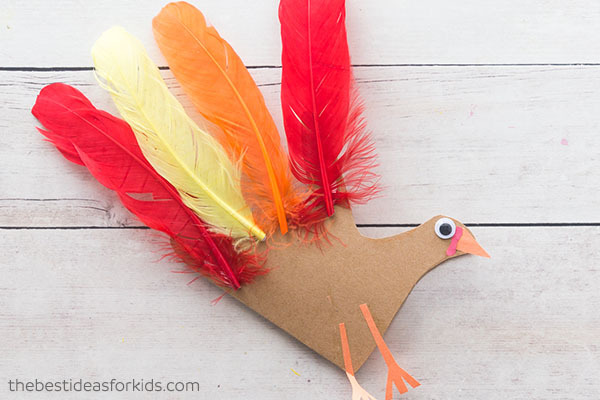 This simple craft by The Best Ideas for Kids is sure to hit the holiday message home. Remember playing pick-up sticks as a kid? This DIY-version of the beloved game follows the same simple rules. Each stick color represents a different category or thankfulness—including people, places, food and things—and kids learn to identify things they’re thankful for and how to express their gratitude. You can use this template from Teach Beside Me, or get creative and make up your own rules. For a sweet twist, try using different colored candies! Practicing the ABCs and teaching thankfulness? Count me in! All you’ll need for this Parents.com craft is a notebook and something to color with. To get started, designate one page for each letter of the alphabet. Then, have the kids pick one thing they’re thankful for each letter of the alphabet—from A to Z! They’ll have to put on their creative thinking caps to tackle those tricky letters. OK, maybe Thanksgiving is a little about the food. But making delicious treats doesn’t only have to benefit the baker. Delivering desserts to a neighbor, community organization, grandparent or friend is a sweet way to get kids involved with giving back. Don’t have a go-to family recipe? Try Care.com’s easy cookie recipes. To whomever they decide to say “thank you,” this is a great way for kids to put gratitude into practice. Trimming the tree isn’t just for Christmastime! When I found this craft on All Things Mama, I fell in love with the idea. (But even more in love with the fact that it requires almost no cleanup!) Using a vase, twigs and gift tags, kids will get to decorate the “tree” with everything they are thankful for. A bonus: It instantly becomes the perfect tabletop decor for their parents’ Thanksgiving feast. Check out the full instructions on All Things Mama. Even though Halloween is over, pumpkin season is still in full swing! This craft from Simple Most is just as cute as it is easy. All you need is construction paper, a marker and some glue. Throughout the holiday season, the Gratitude Pumpkin will be a constant reminder of all there is to be grateful for that the whole family will love. When it comes to little ones, getting a variety of answers to the “What are you thankful for?” question can be tough. This gratefulness game is the perfect way to brainstorm answers—beyond PAW Patrol and popsicles. Use prompts like “Who is someone you could say ‘thank you’ to today? And why?” or “What is something you do with your mom and dad that makes you happy?” These questions will help you spark those creative juices. Use Hands on as We Grow’s full list of sample questions, or come up with your own! Want More from Auntie Lo?